U.S. meat exports continue to improve and there is no one who is happier or more proud of that fact than Phil Seng, CEO of the U.S. Meat Export Federation. 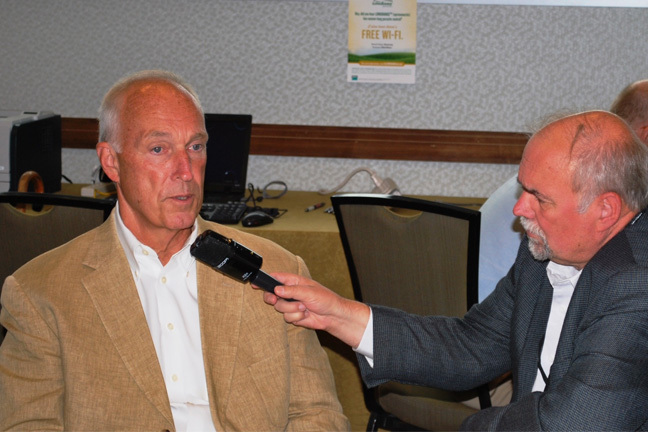 He spoke with Radio Oklahoma Network’s Ron Hays at the Cattle Industry Summer Conference in Denver. You can listen to the full interview by clicking on the LISTEN BAR at the bottom of this story. Seng said he is most proud of the improvement in the Japanese market. It was our largest customer in 2003 and is now set to repeat that distinction in 2013. Seng says one of the big reasons U.S. exports are up is confidence in the nation’s economy bolstered by its government. The June numbers show increasing sales for both beef and pork and that’s good news, Seng says. While Japan has been very helpful for U.S. exporters, Seng says the USMEF is still trying to get Russian markets reopened to U.S. products. He said he hopes that we will see some indication that Russia will reopen its market to U.S. beef by the end of the year. He said short supplies due to disease concerns in domestic Russian herds could mean an increased demand for both U.S. beef and pork. With worries in China, Japan and Russia over the use of Ractopamine, the news that Tyson will no longer accept cattle from feedlots using Zilmax has Seng a little concerned. But, he said, it bears more monitoring as U.S. products have never been barred from a market due to food safety concerns. Seng said that the very real prospect that a farm bill will not be passed by the end of September could be problematic for farm product exporters. He said that agricultural exports have been one of the bright spots in the U.S. economy and a further delay in a permanent farm bill would only prolong the agony felt by producers and our trade partners. He said it is crucial to have stability in farm policy so that our trade partners can be secure in the knowledge the U.S. will be able to adequately supply their markets. Phil Seng talks with Ron Hays about the success of U.S. meat exporters.